We do what we love and love what we do. And it shows! That's our story. We hope to have the opportunity to learn yours. Neat, organized and clean, Paul`s Auto Repair is an independent, full service auto repair shop located in Great Neck, NY answering the needs of our customers for local high-quality auto repair and service at affordable rates. We are offering superior customer service, quality products and the right solutions for your auto care needs with professionalism and a level of customer satisfaction second to none. Whether you need routine maintenance, an extensive overhaul, major repair or a complicated diagnostic, we can do it all. Our goal is to maintain your vehicles in a safe and proper operating condition and provide you, with dependable transportation and worry-free driving. If you're looking for an excellent auto repair shop that you can trust - contact us now! All of us at Paul`s Auto Repair are here to help you every step of the way with trustworthy advice, unbiased information, technical expertise, and friendly customer service. We will always answer your questions and explain our work so that you feel comfortable leaving your vehicle with us. We are friendly, knowledgeable and easy to talk to. Paul`s Auto Repair offers written estimates before performing any auto repair service, won't take any actions unless you approve them first and will never surprise you with any unauthorized car repairs. We pride ourselves on getting things right and stand behind our work with a 12 month/12,000 mile warranty. So when something feels wrong with your vehicle, don't hesitate to bring it to Paul`s Auto Repair. Our complimentary diagnostic service is FREE of charge and without obligation! We treat your car like we would treat our own, with the utmost respect and attention. From fender covers to floor mats to steering wheel and seat covers, we take pride in delivering stellar service and care while your vehicle is in our hands. We also installed clear windows and doors between the customer waiting area and vehicle service area, giving you a transparent view of the work being performed on your car. When you come to Paul`s Auto Repair, we always thoroughly inspect your car and advise you on the health of your vehicle so that you can make the most informed decisions when it comes to maintenance and repair services. It is a FREE complimentary courtesy check, at no cost to you. All major systems are visually examined – your tires, fluid levels, battery, lights, wipers, belts, hoses, suspension, brakes and more. Excellent service you can count on at a price you can afford! There never seems to be a good time to have work done on your vehicle. We understand that you’re busy, which is why Paul`s Auto Repair is open 7 days a week, from 8:00 AM to 6:00 PM to accommodate your schedule. You can bring your car in before you head off to the office a pick it up at your convenience. Our pick-up/drop-off service can pick up your vehicle from your home or office and return it when our work is done. If you need to bring your vehicle in after hours we have a night drop system for your convenience. Just park your car and lock it up in any available parking spot. Leave your name and number with our Gas Station attendants and we’ll contact you once we get your car checked in. Our FREE complimentary shuttle service provides transportation, making it easy for you to get on with your life! Quality is not an act, it is a habit. It means doing things right when no one is looking. Paul`s Auto Repair embodies a standard of quality held only by the most respected auto repair facilities in the industry. Reputation, integrity, qualifications and expertise are the driving forces of our business. We believe in offering a total auto care experience that perfectly meets your needs and take pride in understanding your vehicle from bumper to bumper. For brakes and brake repair, tires, oil changes, mufflers & exhaust, radiator repair, and all your auto repair needs, you can count on Paul`s Auto Repair to provide the auto repair service you need, only when you need it. Quality is not expensive its priceless! Thanks to our personal approach to business - one customer at a time - all our clients eventually become our friends. We build customer loyalty by treating people like family - with kindness, respect, and courtesy. We listen carefully, explain and communicate, give you honest answer and look out for your best interest. Become a part of our extended family of satisfied clients! Happiness is subjective and difficult to measure, but it is directly proportionate to quality of life. It is your personal satisfaction with the conditions under which you live. That is why we want a world where good life is preserved, and the quality of life is enriched. Expect our commitment to excellence to improve the quality of your life! We make it a very high priority to get your vehicle ready to go as quickly as possible. Most repairs are completed the same day you bring your car in. New York State Inspection, oil change, flat tire repair, tire rotation, light bulb replacement are all while-u-wait services. No appointment necessary! We're dedicated to protecting the environment by providing drivers with a safe and easy way to dispose of used oil and batteries. Our shop adheres to the highest environmental standards and offers many options for drivers who are environmentally conscious. We recycle about 75 percent of the waste generated in our shop, including used tires, fluids and other automotive products. Waste oil and used battery recycling is as easy as abc. Recycle today! We employ ASE certified technicians. 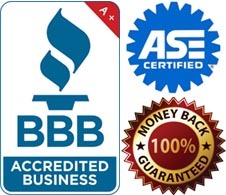 Automotive Service Excellence (ASE) ASE is the industry standard and the most trusted certification process in the automotive repair industry. Because this industry and the vehicles change so quickly, we must continue with our training several times throughout the year. This allows us to provide our customers with the best automotive services that we can. With Paul`s Auto Repair ASE-certified technician, you know your car is in good hands, our experts have been doing this for many years. Our auto repair staff is extremely knowledgeable and skilled when it comes to the repair of any vehicle, whether Domestic, European or Asian – any make or model.